The barrage of successful film crowdfunding stories may lead many filmmakers to believe crowdfunding is easy money. The truth is that it requires the same level of research and prep a film production requires. In this post we’ll compare some of the top crowdfunding platforms geared for film projects so you can identify the best fit. Far in advance of actually creating a campaign, you and anyone else on your team should allocate a fair amount of time to researching the campaigns of films and projects that are similar to yours. Find projects of similar length and genre, both the smaller scale and larger scale versions. Make note of campaign strategies and tools that could be replicated for your campaign. Scrutinize the unsuccessful campaigns and identify pitfalls so you can avoid them. Every campaign launched hopes to be successful, yet only a certain percent are: what makes the failed ones go wrong? The more prepared you are, the better your campaign will be. Far and away, Kickstarter is the most popular crowdfunding website of choice. It’s well established due to multiple celebrities who have run major campaigns, and it has a fantastically designed interface that allows for plenty of creativity. The key detail is that Kickstarter is all or nothing: if you do not reach your goal, you receive $0. If you do reach your goal the website takes a 5% cut – be sure to factor that into your budget when you decide the amount you’re going to raise. The all-or-nothing factor may seem intimidating, but the result is actually designed to benefit both donors and creators. For donors, if you want to support a project, you want it to be what you’re signing up for: a $300 short film looks very different from a $30,000 short. For creators, this similarly assures that you will only be making the project if you have the financial and community support to get it off the ground. Having the necessity to reach a goal can motivate the entire team to make it happen. If there’s a Coke vs. Pepsi rivalry in the crowdfunding world, it would be Kickstarter vs. Indiegogo. The counter argument that Indiegogo brings is that you do not have to meet your goal in order to keep your raised capital. That may sound immediately appealing save for one caveat: the site takes 9% of your earnings if goal isn’t met, but will only take 4% if it is. If you meet your goal, you will save 1% more than you did on Kickstarter. Indiegogo therefore inspires creators to aim for loftier goals with the understanding that they don’t “need” to reach their goal. Indiegogo makes for a more relaxed campaign, knowing that the goal isn’t as critical. This can be both a positive and a negative trait. Just don’t forget that 9% is a major cut of your hard earned crowdfunding. 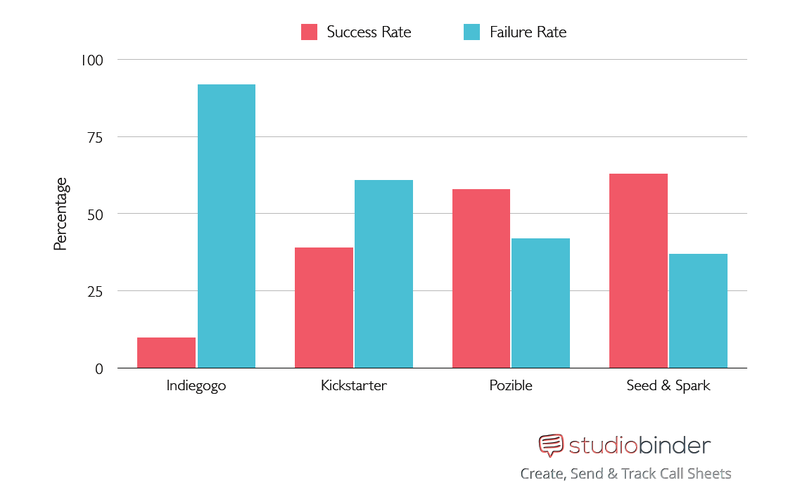 Statistically, only 13% of Indiegogo projects are successful. A newer alternative that is designed specifically for film related projects is Seed&Spark. They are extremely hands on with helping each project, and requiring every user to go through a greenlight process to make sure they have the means to make their projects successful. The layout is in the same line as a wedding registry, where donors can give more specific donations for specific items. Donors can give out units to help pay for a part of your project, such as camera, gear, catering, you name it. They take 5% only if your campaign is successful. Donors can include 5% extra to cover this charge! According to their FAQ, this means that the average site fee a creator ends up paying is 1.95%. All that being said, it still does not have the brand recognition that the other two have, so it is still very much worth your time to weigh your options depending on what may be best for you. TubeStart focuses on digital video creators like Youtubers or those with an established online audience. Their model seeks to solve the pain points associated with crowdfunding in the film and video space. They do requires an base of 15,000 subscribers to build a project on their site.Tubestart offers four Funding Models; Fixed funding (4% all or nothing), Flexible (8%, and if you meet goal 4% is refunded), Subscription funding (ongoing or one-time at 4%) and Pledge funding (backers pay amount amount for every video you release, or one-off at 4%). It is the rewards (or perks) that differentiate them from other platforms. Handsfree: Tubestart partnered with Spreadshirt and Cafe Press to offer 800 customizable products that are fulfilled as ordered, versus ordering large runs. Example T-shirts, hats. Biddable: Auctions rewards to backers. Example: walk-on-role, producer credit. Sponsored Rewards: Qualifying projects only. Brand offerings integrated with your rewards – you keep all the profit. Example: Coupon codes, sponsor merchandise. Co-funding: Tubestart works with publishers and studios interested in crowd vetted productions who are willing to support projects with 10-50% of their funding goals. For more information visit Tubestart’s handbook. Patreon is unique in this list. Rather than backing a one-off project, Patreon wants patrons to back the content creator as a sustainable form of income. The service has attracted many Youtubers and web series content creators who need a recurring source of revenue to support their ongoing work. So if you have a ongoing series or Youtube channel in the works, and are looking for recurring capital, check out Patreon. Backers select how much they want to fund a creator on a monthly basis, and Patreon takes 5%. Note that there are additional credit card fees that range from 2-4%. In exchange for the ongoing financial support, creators provide their backers with updates and exclusive “rewards” such as bonus content, private google hangouts, and crowdsourced collaboration. Creators are encouraged to galvanize support by creating goals so backers can see exactly where their capital is going (i.e.”Once I raise $3,000, I’ll be able to purchase a new camera that’ll help me take better videos for you.”). Slated is different than most crowdfunding platforms. According to their site, the platform attracts high net-worth investors and experienced industry professionals in their network. Rather than creating campaigns with strict deadlines to raise a specific amount of capital, Slated requires you to create a profile for your project so their community of investors can discover your project. If potential investors like your project, the system encourages them to reach out to you personally. In other words, instead of you finding investors, investors find you. Investors are recommended projects to fund based on their taste profiles. Investors can track and follow projects. If an investor tracks you or your film, you can email them directly. If the investor is not tracking you, you can also be ‘introduced’ via a mutual contact by selecting the person you know in common to make the introduction. No funding is actually transacted though Slated. The goal is to create deeper relationships so the conversation can be taken offline where larger checks can be written sans transaction fees. Slated is intended for feature films with budgets of $500,000+ and documentaries with budgets from $250,000 to $2,000,000. In order to become an investor, you need to be accredited by the SEC as an investor, referred by other members and be approved by the Slated team. After you decide which crowdfunding model will work best for you, it’s time to think about how much money you are going to raise. It’s difficult to give complete advice on this without understanding the specifics behind your project, but there are some universal considerations. How much capital will your project require? Create an idealized version, a bare-bones version, and a happy medium. Don’t forget to consider post-production expenses. 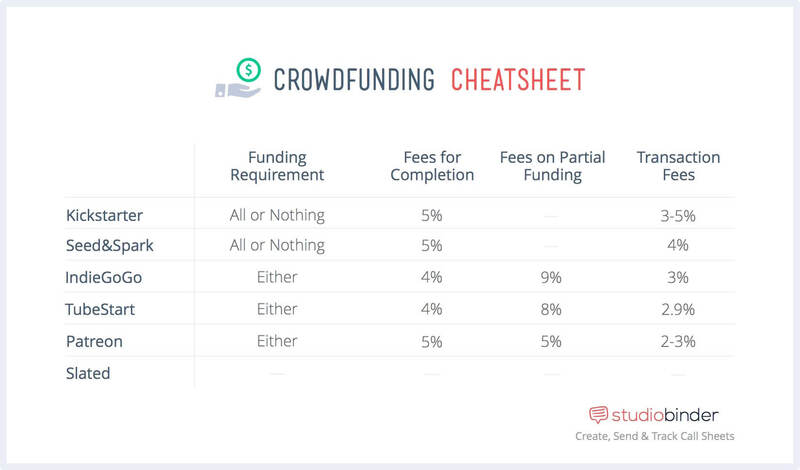 Figure out how much funding you, and/or your team, can contribute before the campaign. 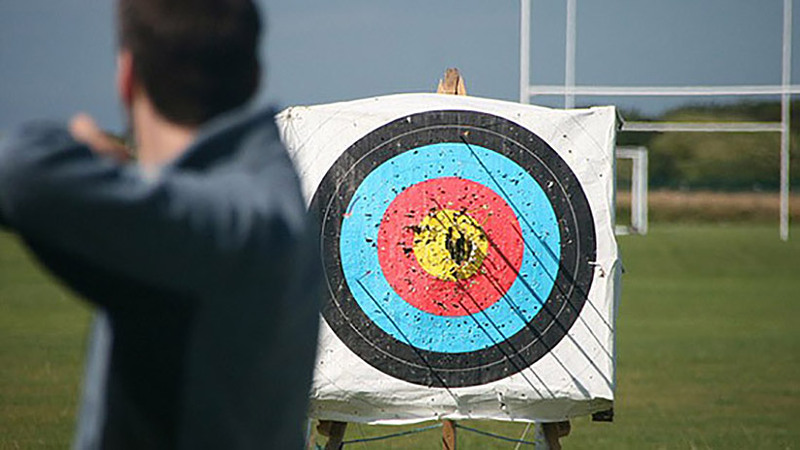 Find a goal allows you to fulfill an ambitious yet still plausible interpretation of your project. Although we can’t cover every crowdfunding site in the world (there are 750+ and counting), these are some of the more popular choices geared towards video and film projects. Want to explore more crowdfunding sites? 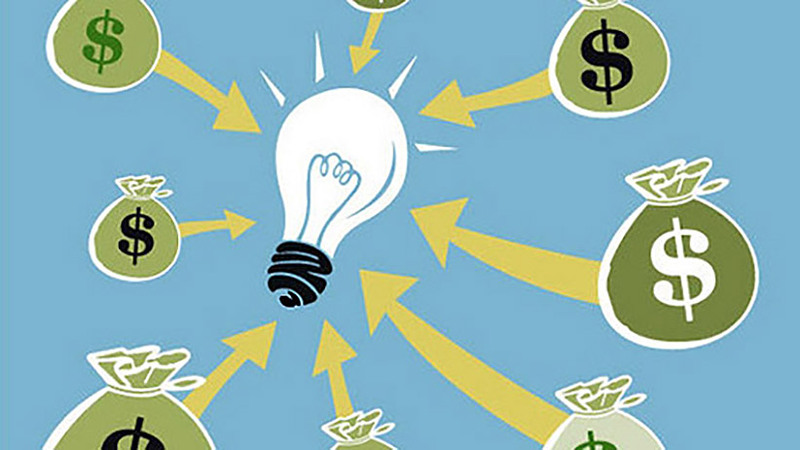 Check out this list of Global Top 100 Crowdfunding Sites. After you have identified which crowdfunding site is the best fit for your project, make sure to read Crowdfunding Films: Part 2 — Prepping Your Campaign where we’ll cover budgeting, the art of the perk, shipping fulfillment, campaign updates, and more! Denver, Colorado native. Passionate advocate for independent filmmaking and movie watching. Lover of writing and finding new experiences in all kind of places.